Sept.22 – See Urgent Announcement: Honor Flight Section! We are in full swing with exciting plans for our seasonal programs and charitable activities. So much is happening to provide you with experiences and events you will enjoy and remember. This is our mission. Please come early to the program on Monday and bring your checkbook and a little cash. You won’t be disappointed. If you arrive early at 5:30 you’ll be able to purchase seats for our October Member’s Celebration Fiesta Luncheon or tickets for the November program before the program begins. Tickets will also be available for the first of three interesting and informative lectures that benefit our Scholarship committee. Climbing Mt. Everest with Dr. Klein is the first. You won’t want to miss it. We are raising $$ for TWOQC Scholarships, too. Any loose change you can feed the piggies, or gifts you might wish to purchase is deeply appreciated. We thank you in advance for your generosity and commitment to women and education. Join us Monday to learn how to liven up your home with tips from Lily Guthrie. Lily has been featured on HGTV and is excited to share her experience with TWOQC. Need ideas for making your home décor a little different? Bring your questions to Monday’s program. 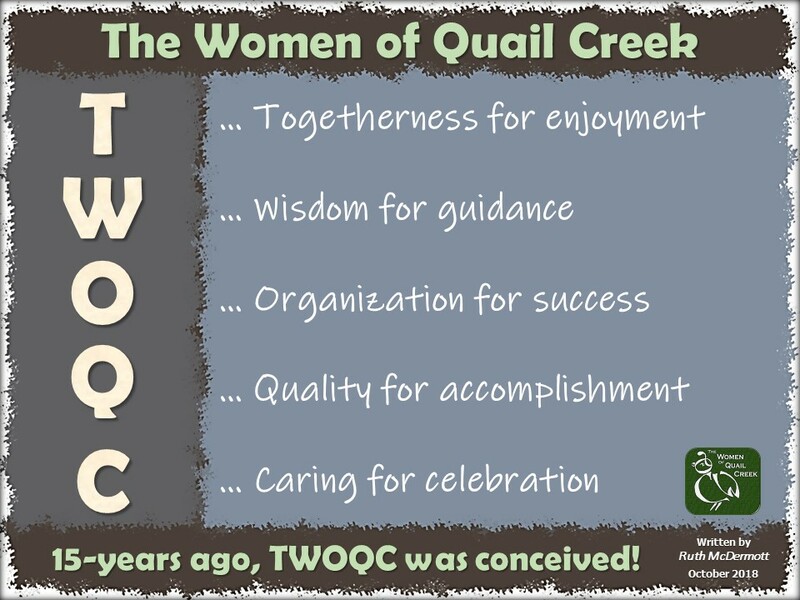 Join us for a luncheon fiesta in celebration of TWOQC! The party comes with mariachi’s and the beautiful vivid colors of Mexico on display through out the ballroom! Add a yummy lunch and you have the ingredients for a special celebration. Reservations will be available at the Monday’s program on September 24, and by contacting Janice at (951) 230-1171 or events@womenqc.com. Here’s a suggestion… find a group of friends to celebrate with you! The cost is $10 for members, $25 for first-time guests. By the way, you can join TWOQC and your dues of $25 covers you from now until end of 2019. Then as a member you can purchase your Celebration reservation for only $10. A TWOQC first-time event will take place November 12 from 6:00-8:30 p.m. in the Ballroom. Getting Holiday Ready – Ladies Night Out will give members a chance to get pampered and get holiday tips for both themselves and their homes. Your $5 ticket gets you passed hors d’oeuvres, lessons in cookie decorating, holiday cocktail mixing demos, personal accessorizing ideas and a chance to have a mini-facial or massage. And that is just some of what will be happening during this members-only event. Beer and wine will also be available for $5 at the event. Tickets will be sold at the back of the ballroom this Monday. Cash only, please. Oktoberfest is ushering in our fall season with a gala event to benefit scholarships. You will enjoy, a wonderful German menu complete with apple strudel, plenty of Oktoberfest style beer and wine, and the energetic polka music of the Bouncing Czechs. The festivities will include many opportunities to help fund the 2019 scholarships for women. An awesome silent auction, 50/50 raffle, and an array of basket raffles are among the choices. You will have a headstart for purchasing 50/50 raffle tickets, pilsner glasses (free fill included) and other items as they will be available at the program Monday night. So, join us in supporting our TWOQC Scholarships for 2019. We have a few single seats left so if you have been hesitating to buy a ticket since you had no one to go with you, don’t fret. We guarantee friendly people at each table and you might find some new best friends! There are a few scattered seats for two available too. Contact Peggy at positivelypeggygv@gmail.com or call (520) 207-6188 if you want a ticket or information regarding the sale of 50/50 raffle tickets and pilsner glasses. If no answer, please leave a message and she will call you back. Cash or checks only payable to TWOQC Charity Account. If there are any left, tickets will also be sold prior to the program on the 24th. The next Honor Flight (#26) to Washington DC will be Oct. 27-29th. Please start writing to the veterans. It’s best to make the notes generic: “To a Hero” or “To a Veteran”. Honor Flight #25 has been cancelled. Due to severe weather in Dallas, American Airlines cancelled our connecting flight to BWI and they were unable to make any other arrangements for us. Therefore all airport festivities (today and Monday evening) have also been cancelled. The Honor Flight staff is working diligently to reschedule this flight. Please stay tuned for updates when information becomes available. As always, check the Honor Flight website as they will have the most updated info. Please welcome our newest members: Judy Craig, Harlene Jackson, Myra McCune, Lois Owen, Janice Pereira, Jan Schoeben, and Kathy Weede. We will see you at the New Member Wine and Welcome Party on September 27 from 1:00-2:30. To attend the party please RSVP to membership@womenqc.com if you have not already done so. Please bring your completed 2019 membership form and check for $25 made out to TWOQC to Monday’s program. After buying a lot at Quail Creek, Joyce and her husband Harold “Buzz” moved to Green Valley in 1990 from New Orleans, LA and their home was completed in 1991. Joyce recalls there were only around 10 houses occupied and the desert was everywhere. There was a two-lane entrance, no railroad crossing arms and Security was about ¼ mile from the four way stop sign. There was a double-wide with a Pro Shop and a snack/drink bar located around #1 quail golfing. Imagine no road there, says Joyce, with a driving range behind the double wide! Joyce worked for Delta Air Lines for 32½ years as a ticket agent, stewardess, and a manager of 499 women and one male in Dallas, Texas (males were just venturing in). She then married and went back to being a flight attendant. Buzz and Joyce did quite a bit of traveling until health problems put a stop to that joy in their life. When they moved here Joyce was the youngest person living in Quail Creek who was still working. She took early retirement as the commuting became difficult. When organizations started forming, Joyce assisted Joy O’Farrell with TWOQC, PAG and was one of the originals to start Putters which continues to grow. She also helped with Golf Niners. Joyce and Buzz are the only original couple who still live in Quail Creek. They are both glad they moved here. They thoroughly enjoy it. It’s like a big family with everyone friendly, helpful and supportive. The 2018/2019 Kino Lecture Series kicks off with “From Tucson to the Top of Mt. Everest: Dr John Klein’s Odyssey”. The lecture is open to all residents and everyone is welcome. The need for unopened toiletries for the homeless veterans continues throughout the year. And right now they can also use sunglasses and sunscreen. The hospitalized veterans like the calendars, both wall and pocket style. Snacks and disposable plates, cups and utensils—packages may be opened—are always needed. Check your cabinets and drawers to see if there is anything you won’t be using. You may place all items in the rear of the ballroom at the program on September 24th. If you won’t be at the program, you may drop donations at Peggy McGee’s house, 1908 E Longspur Place. “Thank you” to this week’s FMM contributors: Suzan Bryceland, Yasmin John-Thorpe, Peggy McGee, Janice Messer, Diane Quinn, Kay Robinson, Angie Werner, and Julie Woodard.